Casa Argentina hosted a tango opera to support the Latino community. New Orleans Opera and Casa Argentina presented Astor Piazzolla’s Maria de Buenos Aires, a tango opera, which shares the work of renowned Argentine musician and composer Astor Piazzolla. Proceeds from the event were allocated to organizations that serve the Latino community. The sold-out event featured decorations which matched the opera setting, all in black and red with red florals and greenery. Chef Carlos Rafael Lainez of the JW Marriott provided a menu including arepas and lamb chops at the Patron Party accompanied by Argentina Chardonnay and Malbec wines. The dinner menu also featured pairings with Argentine wines. 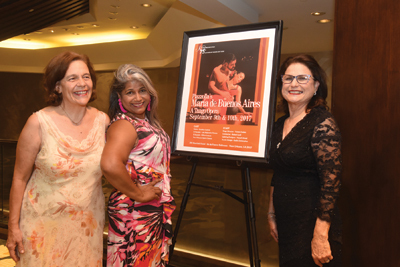 The opera was interpreted by Colombian soprano Catalina Cuervo, Mexican baritone Luis Alejandro Orozco, Argentine Milton Loayza and an ensemble of two couples of professional singers and tango dancers, Maureen and Carlos Urrego and Jermias Massera and Mariela Braufaldi. They were accompanied by renown duet of bandoneonist Daniel Binelli and pianist Polly Ferman, musicians of the Louisiana Philharmonic Orchestra and the local Polymia Quartet, directed by Robert Lyall, Artistic Director of the New Orleans Opera. In addition, Julio y Cesar and their band provided music for the patron party and for dancing after the dinner and show. Yakelis Anzola, Marlene Donovan, Juan Gershanik and Betty Speyrer served as Event Chairs. Approximately 300 patrons participated in the dinner and show.